Graphics cards, or GPUs, are one of the primary components of any computer. But, what is a graphics card? Why is having one so important? From playing games to editing videos and even browsing the web, graphics are everywhere. With that in mind, you need something to render what’s on your screen – that’s where your graphics card, or GPU, comes into play. In short, a graphics card is a specific part inside of a computer with basically a single job: render graphics. Without a graphics card or something to do that job, you’re not going to have a good day. Nothing will show up on your screen and it’ll be one big headache. So, let’s avoid that by learning not only what a graphics card is, but if you even need one! 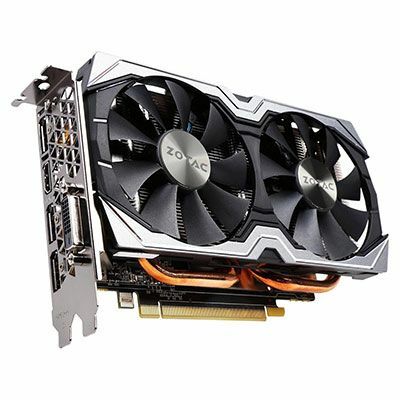 The term graphics card and GPU are often used interchangeably. However, both terms technically refer to 2 different things. A GPU (Graphics Processing Unit) is always a small part of a larger package; it’s quite comparable to a CPU. Not only can you find a GPU inside of a discrete graphics card, but some processors (CPU) come bundled with them as well. When a GPU is paired with a CPU, it’s called an integrated graphics processing unit or iGPU. Often, this is all you need for a general use PC. Most iGPU are more than capable of handling things like web browsing, streaming video, and running programs like MS Word, Excell, etc. Some iGPU are even capable of light gaming. With that in mind, there are technically 2 types of GPUs. Bigger GPUs meant to be used on a discrete graphics card, and smaller iGPUs meant to be paired with a CPU. An iGPU is almost always going to be weaker than a discrete GPU. So, if you want to game on your PC, then you’re definitely going to need an actual graphics card. This is a big reason why most notebooks and cheaper laptops simply don’t work well for gaming – they only have integrated graphics (iGPU). 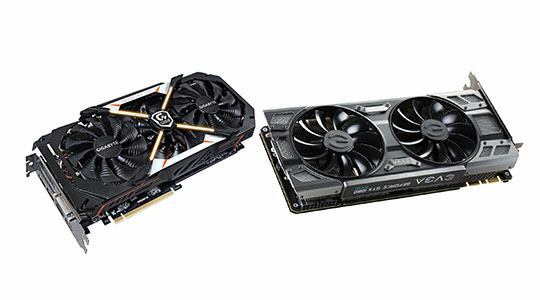 Conversely, unless you’re gaming or using your PC for some other graphically demanding task like CAD or video editing, you usually won’t need a discrete graphics card. Instead, you would be fine with a CPU that comes with its own integrated graphics. 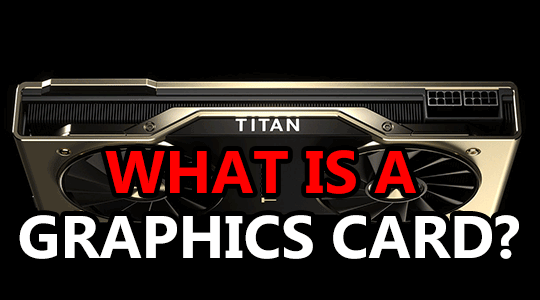 Now that we know what a GPU is and that there are essentially 2 different variations, what exactly is a graphics card? A graphics card is a dedicated piece of hardware that includes a GPU, its own memory called VRAM, and its own cooling. Not only are they good for rendering images, but they’re also great at number crunching (hence the cryptocurrency-fueled GPU shortage of 2017-2018) and other computational tasks. They’re actually so good at number crunching that specialized cards have been produced, like Nvidia’s Tesla, to be used specifically in supercomputers for various scientific and engineering purposes. However, most people just use graphics cards to play video games, edit videos, do CAD, and occasionally as an extra space heater depending on the model. With that in mind, graphics cards are undeniably the #1 most important part in any gaming PC. You could have the strongest CPU in the world, but if you have an exceptionally weak graphics card then your games simply won’t run well. On the other hand, you could have a weak CPU and a strong GPU and get way better performance in comparison. Some games are more reliant on your CPU than your GPU, but as a general rule GPU is #1. So, always plan to spend a good portion of your budget on your graphics card when building a new gaming PC. Often, your GPU will cost as much as if not more than your CPU. When it comes to upgrades, it’s really no different. If you have an old CPU and an old GPU but you can only upgrade one, you almost always want to pick your GPU first. As was mentioned in the previous section, graphics cards are made up of numerous components. Since we’ve already covered the GPU, lets quickly go over the other basic parts of a graphics card. VRAM: Just like your computer needs system memory, or RAM, your graphics card requires something similar, VRAM. In a graphics card you’ll find numerous VRAM chips based on how much memory your card has. This could be anywhere from 1 to 8 or potentially even more. Generally, each chip will contain 1GB of VRAM. Like system memory, there are different levels of VRAM. Currently, the newest cards are running GDDR6, but GDDR5 is still common as GDDR4 is quickly becoming obsolete. However, unlike RAM, most motherboards can support any level of GDDR VRAM without a worry. PCI-E connection: Since your graphics card has to plug into your motherboard, it needs a way to do that. Enter your PCI-E connection, or PCI-E interface if you want to get technical. It’s the long golden bar filled with what might look like flat pins on a circuit board (because that’s what they are). This isn’t to be mistaken with your SLI/Crossfire link that’ll be much smaller and contain more segments. Power connections: Most graphics cards need some kind of external power connection, although not all of them do. Chances are, your graphics card, or the one you want to buy, does. These can be identified by their square shape and multiple pins. Often, graphics cards will take anywhere from 4-12 pin power connections from your power supply – so make sure it has enough for your card! Display outputs: On the very back of a graphics card you’ll find its display outputs. Generally speaking, most modern cards come with at least 1x HDMI, 1x DisplayPort and sometimes a DVI and/or VGA connection. If you want to run multiple monitors, make sure your card has enough of the required outputs as there’s no real standard concerning how many they should contain. While your typical enthusiast can often estimate the potential of a graphics card based on hard numbers, most others won’t be able to. That’s why one of the most reliable metrics to gauge the performance of a graphics card is by the FPS – frames per second – it’s capable of rendering. To do that, you’ll have to actively seek out reliable benchmark results from sources like GamersNexus and/or Hardware Unboxed, or other reputable sources. Beyond benchmarks, it can be pretty difficult to guess how well a card might perform based on numbers alone. Especially if you’re trying to compare Nvidia vs AMD, then it gets even more difficult. Generally speaking, benchmarks are arguably the best metric for gauging the performance of graphics cards. The vast majority of graphics card are equipped with some kind of cooling. Most often, cards will come with either blower or open-air cooling. Some of the more expensive options might come with closed-loop liquid cooling or a water block for a custom liquid cooling loop. Between blower and open-air cooling, open-air is generally the better option for the vast majority of people. This is the most common type of cooling option and it can be recognized by their 1 or more fans and unrestricted heatsink fins. Open-air cooling works by taking air from the inside of your case and exhausting it out through your graphics card. Blower coolers often utilize a single blower-type fan and a completely closed body; they work by bringing air in from the outside and exhausting it inside of your case. Closed-loop liquid cooling, sometimes referred to as AIO or All-In-One liquid cooling, works by circulating liquid through a radiator and then through your graphics card. They’re often more expensive and sometimes less reliable than air-cooled options. Custom loop liquid cooling is very similar to an AIO system, only you have to build it yourself. All graphics cards come with an array of connectivity options. Most modern cards come with at least 1x HDMI, 1x DisplayPort, and potentially DVI and VGA connections. However, the latter 2 are becoming less common, especially VGA. Some cards might come with more DisplayPort connections or more HDMI connections based on its make and model. 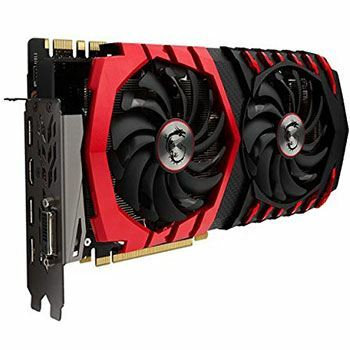 Generally speaking, no 2 graphics cards are the exact same even if they’re the same model; different companies might use different connection options. GPU drivers aren’t a physical part of a graphics card, but they directly control how a card can perform nonetheless. They’re basically a type of software that (should be) downloaded from the manufacturer of your GPU, they often include various performance tweaks and optimizations. For instance, if you’re running a graphics card with an AMD GPU, you should download your drivers here. Or, if you’re running an Nvidia GPU, then you would get yours here. A card running obsolete drivers can often perform much worse than one running a newer version and so it always pays to keep your graphics card drivers up to date. It’s most common to see new drivers release around the same time that major games do; GPU drivers are often optimized for these major releases. So, next time a big game releases, check for a new driver update! Who makes the best graphics cards? This gets into some tricky territory that requires a bit of explaining. First and foremost, there are 2 main companies who manufacture GPUs to be used in graphics cards. Nvidia is the biggest of the two, AMD is their primary and only real competitor. It’s been this way for at least a decade and probably won’t change anytime soon. Both Nvidia and AMD make good GPUs. However, there’s no denying that they have their distinct differences; primarily concerning price and performance. Nvidia often makes arguably better and stronger hardware. AMD can often make equally good GPUs that sometimes even surpass Nvidia while offering lower prices, usually. Which one is the best often boils down to personal preference and who offers better overall performance (and price) for your particular use-case. Beyond AMD and Nvidia, you have the AIB (Add In Board) partners. These are companies like EVGA, MSI, Gigabyte, Sapphire, Zotac, Powercolor, and a handful of others. Their job is to take Nvidia and/or AMD GPUs and use them to power their own graphics cards. That’s why you can find 10 different variants of any given graphics card from just as many companies. That’s where it can get confusing. When there are so many options, it gets a little hard to pick. Realistically, none of them make “bad” graphics card or they wouldn’t be allowed to make them. With that in mind, some companies are definitely better than others. A lot of people get hung wondering “what is a graphics card?”, “why are they important”, and especially “why are there so many options? !” With that in mind, I hope this quick post was able to help clear all that up, if not just a little bit! At the end of the day, whether or not you even need a discrete graphics card depends on how you’re using your PC. But, at the very least, now you should definitely know what a graphics card is! If there’s anything you feel wasn’t explained well enough, please let us know by using the comment section below! Hey branton i want your opinion on this pc cpu:intel core i5 8400 6 core Gpu:msi gtx 1060 motherboard:msi h-300m gaming plus. Ram:16gb ddr4 2400 mmhz. Ssd: 120gb. Hdd:1TB seagate barracuda. Powersupply:500watts bronze. The i5 8400, GTX 1060, and 16GB of RAM are great, but I’m not familiar with that particular motherboard and power supplies can be good or bad depending on their make & model. Great choice in monitor also, BenQ is an awesome brand. The RTX 2060 would definitely be better than a 1070, it has noticeably better performance (comparable to a GTX 1080) and should cost about the same as a 1070 unless you’re buying used (I wouldn’t suggest buying used). Oh, and I’m not saying your PSU or anything is bad, sorry if you thought that; it’s just hard to say exactly how good parts like that are without knowing the makes & models.